Nikki started working at Ravenwood when she was 18 and never left. 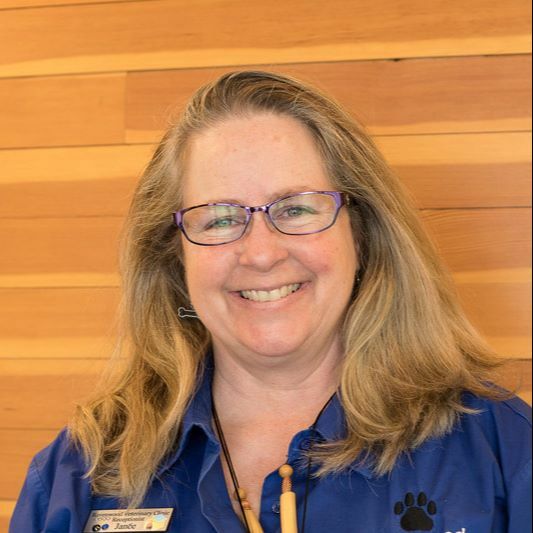 She began as a kennel assistant and worked to become a licensed veterinary technician with a passion for exotic animal medicine and low stress handling . As time flew by she became the lead technician and head receptionist for a time. She is currently working on making the clinic paperless and working on the new website. Anita is a retired legal professional with a penchant for paperwork. She has managed our patient record archive since 2008 and loves the challenges it brings. Even more however, she loves animals and being part of the staff at Ravenwood. Anita has found her way to becoming the clinic's photographer and took the pictures for our website. Our team of dedicated receptionists put your pet first every day. Janée was raised in Idaho and moved to Missouri in the mid 80’s to work for the number one Appaloosa farm in the nation, Crown Center Farms. Working there for over 10 years, she fitted and conditioned world champion halter horses & was the breeding manager. During this time she started Tuscarora Stables with standing OZONE, a popular paint stallion that was pictured in many David Stoecklein calendars & books and also fitting and showing client and personal horses including a world champion Appaloosa named LUXURIOUS. When living in Missouri on the farm, she enjoyed raising meat goats, chickens, guinea hens, & loved her livestock guardian dogs Elway & Bear. After moving to Alaska in 2011, she worked in Ketchikan for the tour industry & fell in love with the ocean, fishing, & everything Alaska has to offer. Now she is settled in Eagle River and living comfortably in a homesteader cabin with her family which includes a husband, a Jack Russell Terrier named Olivia de Mayo and two mini dachshunds named Oosik & Mini Pearl, along with a smattering of chickens. Erika has worked at Ravenwood since 2018. She was born in New York and in typical military family fashion , moved several times during her youth. First to Alaska, then Colorado, Louisiana, and then back to Alaska. She graduated from Pickering High School in Louisiana and was 3rd in her class. She has always loved animals, which is what brought her to Ravenwood Veterinary Clinic. She spends most of her time with her daughter and family here in Eagle River. Renee was born in Cincinnati, Ohio. Her Dad was in the military and she spent most of her early years traveling, but ending right back where she started in Ohio. She married her high school sweetheart and currently has a family that consists of a husband, 2 children, one grandchild and one French bull dog named Picard. She has worked in the veterinary field for over ten years and joined Ravenwood in July 2018. She also has a Bachelor of Business Administration degree from Wayland Baptist University. In her free time she enjoys showing her French bulldog in the Non-Sporting Dog Club of Alaska, in which Picard recently became a champion! Renee looks forward to adding more frenchies to her family with the eventual dream of showing at the prestigious Westminster Dog show in New York.